TORONTO—The Canadian Imperial Bank of Commerce anticipates it will issue half as many new mortgages in the latter part of the year as it did in the same period of 2017 amid cooling in the real estate market. The bank has noticed a slowdown in the housing market in the last few months, likely due to changes to mortgage underwriting guidelines, Christina Kramer, CIBC’s group head of personal and small business banking for Canada, said on May 23. Those changes include a new stress test for buyers who don’t need mortgage insurance, which has made it harder for some would-be homebuyers to qualify. “When we take a look at the second half, we continue to see that there will be origination decline, probably in around 50 percent range relative to the same period last year,” Kramer told analysts on a call discussing CIBC’s results for its second quarter, ended April 30. 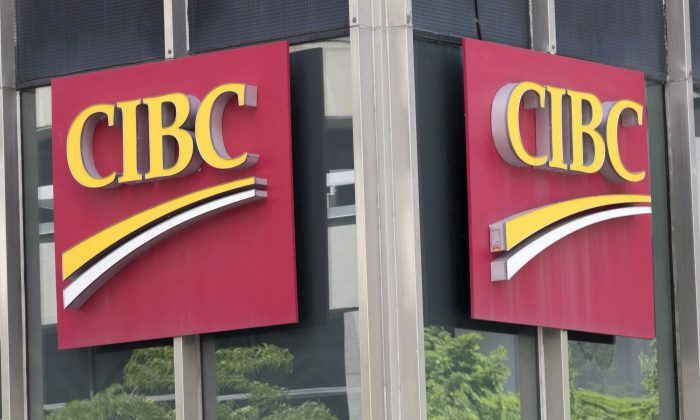 CIBC, the first of Canada’s Big Six banks to report second-quarter results, announced a double-digit profit bump, handily beating market expectations despite slowing growth in mortgage lending. Concern has been mounting over the impact of a cooling real estate market on mortgage loans at Canada’s biggest banks, as national housing sales activity reach lows not seen in several years. In April, home sales dropped to a seven-year low for the month that typically kicks off the busy spring real estate season. The Canadian Real Estate Association largely blamed a new stress test for uninsured mortgages that came info effect on Jan. 1. The new stress test requires would-be homebuyers with more than a 20 percent down payment to prove they can service their mortgage if interest rates rise. CIBC’s said its quarterly profit attributable to common shareholders was $1.29 billion, up from $1.04 billion a year ago on strong results both at home and south of the border after some U.S. acquisitions last year. The bank’s spot mortgage balance for the second quarter was $203 billion, up 6.8 percent from a year ago, but flat compared with the first quarter. By comparison, in the second quarter of 2017, CIBC’s spot mortgage balance was up 12.4 percent from the previous year and up 2.2 percent from the previous quarter. In the latest quarter, the bank booked $7 billion in uninsured residential mortgage originations, down from $11 billion a year ago. The slowdown in mortgage originations at CIBC was welcomed by analysts, which had been concerned about how quickly the bank’s mortgage book was growing compared to its peers. “CIBC’s domestic residential mortgage growth was essentially flat, potentially relieving a relative overhang on the stock as investors have become increasingly concerned with CM’s relative exposure,” Barclays analyst John Aiken said in a research note. Real estate secured lending accounted for 49 percent of total net loans across the “Big Six” Canadian banks during the fiscal first quarter of 2018, according to a recent CIBC World Markets report. CIBC had the highest exposure among its peers, at 62.8 percent. Kramer said CIBC has become less reliant on real estate lending for revenues. Despite headwinds in the Canadian real estate market, CIBC’s chief executive Victor Dodig said the bank expects to continue generating strong earnings growth in excess of its 5 percent target going forward, if macroeconomic environment conditions remain benign or relatively positive. However, Shannon Stemm, an analyst with Edward Jones based in St. Louis, said while it appears CIBC’s diversification is paying off, questions remain about how it will compensate for lower mortgage revenues.